You turned my wailing into dancing, you removed my sackcloth and clothed me with joy. It was created to commemorate the passing of a very difficult time of my life. I seek to dance by the grace of God from darkness to light as I open my heart and mind to Him who has given me the precious gift of creativity. I offer Him all that I am that He might use my everything to bring Him honour and glory And the one who enables me through His precious grace is also the one who has promised to always hold me in His arms (Isaiah 46:4). I know that I belong to Him forever and He will never forsake me or leave me - He is the only one worthy of my trust. The flow of the lines in this piece creates a dramtic sense of movement within the piece. 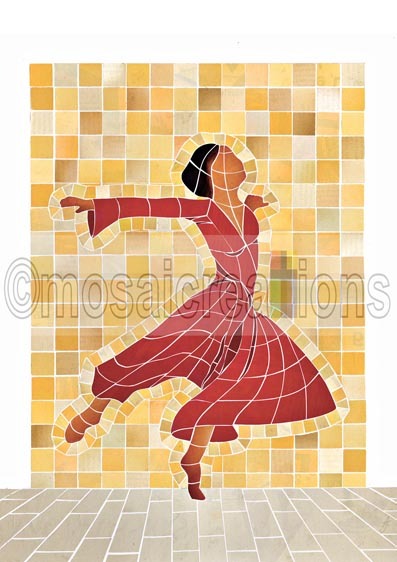 While the figure represents me, I was also inspired by a friend who loves to worship God through dance.